» Forum » Tech » Tech: Modern games » Cyclone Row Out / Grounding Transistor Works? » Cyclone Row Out / Grounding Transistor Works? Cyclone Row Out / Grounding Transistor Works? I have a row of lights out on my Cyclone. I tested the continuity from the playfield to the board. I tested the rows with the jumper from pin 1 on the column connector to the pins on the row connector. It is row 8 that is out, confirmed. I then tested with a jumper from ground to the transistor and it works. What do I do now? When you make a jumper between GND and the transistor, it doesn't mean that the transistor is good. You only close the circuit of that lamp row and than you know the wires are ok. If Q87 is ok, the transitor probably isn't "told" to do his job. In that case the driver transistor or PIA chip is broken. The cpu is good because it is booting up. I would stick a logic probe on the PIA gate, make sure it is pulsing. Then look at the TTL gate output, make sure it is pulsing. Compare to other rows and replace part that is bad. If it is pulsing up to the pre drive base, replace both pre transistor and main transistor. Thanks! Logic probe is on the way from Amazon so as soon as that gets here I can check more. Thanks for the info! This! I was just working/fooled on a system 9 and it was the same type of issue. Replacing both transistors was the solution! Compare one row to another. In all lamps test all circled points should be pulsing (some will be hi-lo and some will be lo-hi). Thanks terryb I'm getting there I want to logic probe everthing on the darn board now, but trying not to break anything as well! Sorry, it's been a bit since I worked on this game. I recall now that I ended up replacing Q87 and when I turned the machine on and ran lamp tests there was a loud hum, smelled burning and then they dimmed and went out. All non GI lights (insert?) are out now. Nothing is visibly amiss and no fuses LOOK blown. I will be happy to pull fuses and check. I just don't know what the path is before the transistors for each lamp row. Where do I start upstream? What is the upstream fuse for the insert lights? I think the GI use the four that are grouped inside the right side of the backbox. Are those also insert? Unsure how to put the various schematics together to understand how the lamp matrix gets power or where to start on this. Think of the lamp matrix like a light bulb with a switch on each side of it. Both switches have to be turned on for the bulb to light. The column wires provide what you're calling power. It is a pulsed signal that alternates across the columns. The rows then provide a path to ground. The row signal is also pulsed to match the specific lamp that needs to be turned on. So the computer knows when column 3 is pulsed and it if wants to turn on the lamp at col 3, row 3 it pulses row 3 low at the same time as the column is pulsed high. So power from the column and ground from the row. F1 would be the 18V for the controlled lamps. You guys are awesome. Logic probed the diodes and D118 was not pulsing. Replaced it and ran lamp test again and now that row is on solid, bright all the time... read the Williams repair guide and saw that it is likely the transistor. 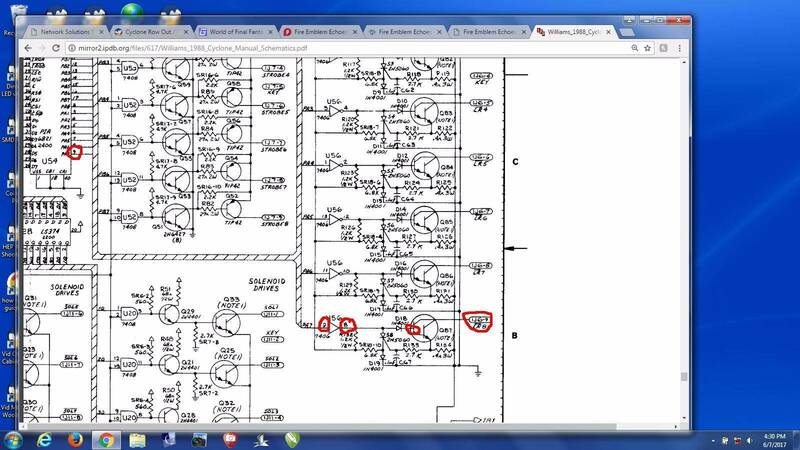 I'll replace that and hope that takes care of it Really appreciate the detailed information, I am starting to understand the schematics much more. Love the logic probe. Really appreciate the detailed information, I am starting to understand the schematics much more. Love the logic probe. I really don't know how people get by without one. A scopes even more fun. A scopes even more fun. ???????? Is this what a doctor uses? there was a loud hum, smelled burning and then they dimmed and went out. OH YES! I forgot, the 8amp fuse was blown. It was a very old looking "blade" fuse (not a wrapped coil inside) and there was no way I would ever see that visually. I knew the GI fuses were inside the right backbox but didn't know that the single fuse below was for the insert lights, so yup! Thanks! How many times do you have to take a board out of a machine to repair it? 50? I have bright and double lights (two lights on, separate rows) for each light on row 8. Make sure that the metal tabs on the TIPs for the lamp matrix are not touching each other. Yeah, that was basically my implication. The top of the board is hard to tell if the solder is touching, so waiting on that magnifier.